A new year brings fresh opportunities, goals and dreams. seems to be on the January agenda. If you are like me- you have been tackling closets and weeding through to donate things you don't wear and making some breathing space on the shelves. 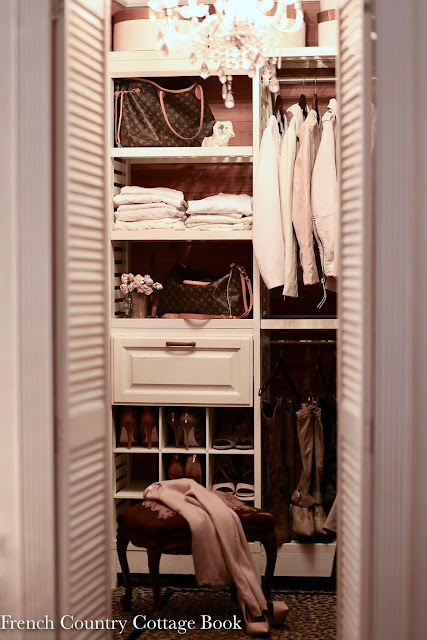 In older homes- oftentimes closet space and storage space are lacking. Or non -existent. Which means you might have some cupboards and armoires doing double duty. 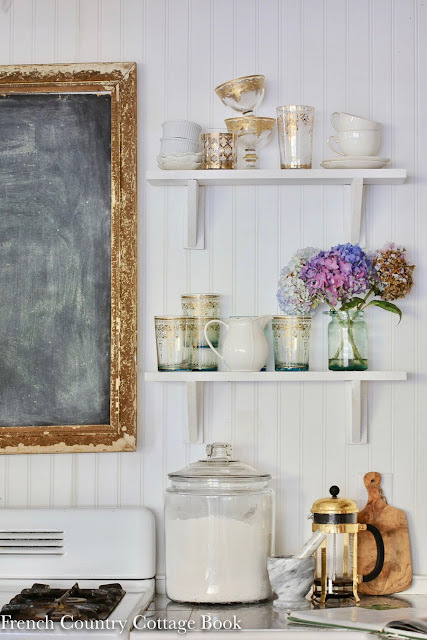 When it comes to collections and everyday display- I love to see those treasures as much as I love collecting. 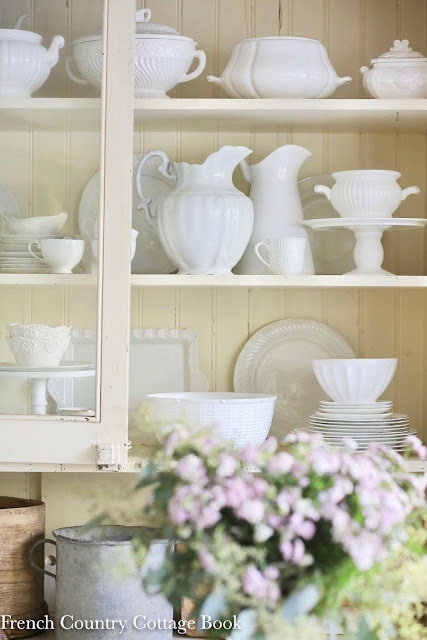 So today, I am sharing a few tips and ideas for organizing those collections and shelves. In the laundry area- which is a small closet that was converted- the lack of storage was a challenge. ALLLLL in those cupboards above the washer and dryer. So for some of the items- like hand soap, body wash, shampoos etc. I looked for bottles of a similar color to group on those open shelves. Simple bottles like simple little amber bottles and soaps/spray bottles -are perfect- or you can find them already full in your preferred scent and just refill. cohesive display. White pants, shorts, skirts, t-shirts etc all folded on one shelf. Black on another, neutrals like blush and grays on another. It makes choosing your outfit easy-just go to the shelf with all the blush to find what you need for example. And it makes display pretty. 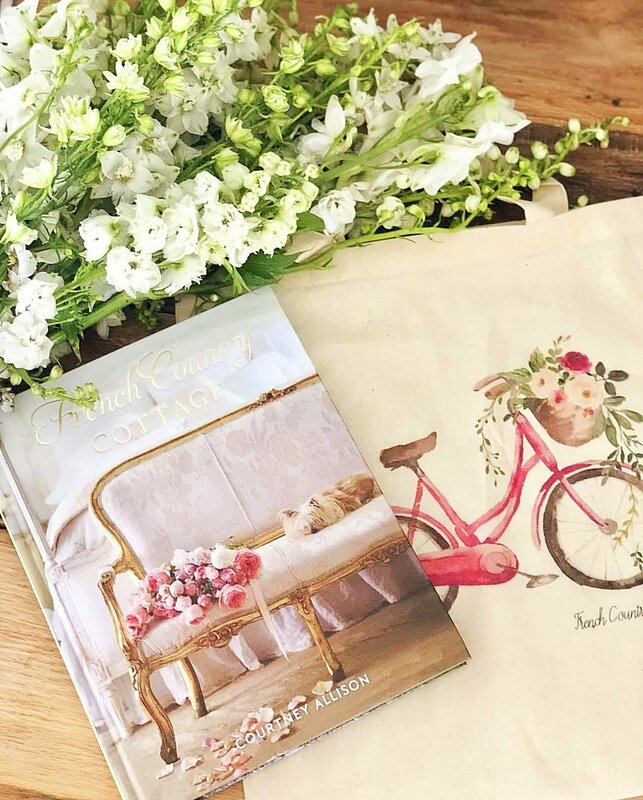 And don't forget to incorporate your favorite handbags and fresh or faux flowers for a warm touch. Inside cupboards is less daunting for organizing- things are hidden away with the close of the door. But that doesn't mean that keeping things tidy and organized isn't a good idea. It makes those collections much easier to glance at and find what you are looking for. In the vintage cupboard in the dining room- I have oodles of vintage china. Stacks of plates, platters, bowls, teacups and more. I layer them by size and style mostly- and it makes finding exactly what I need easy. 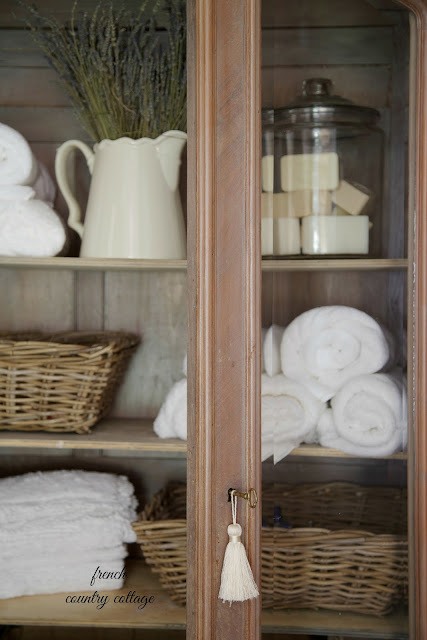 Charming Baskets are a favorite way to store items and keep them tucked away while keeping them easily accessible. In the kitchen, when renovating the sink area- we took out several drawers in favor of open baskets on shelves for a more 'French country' look and ease of storing those things like potatoes and other root vegetables. those baskets on the shelves in the armoire. 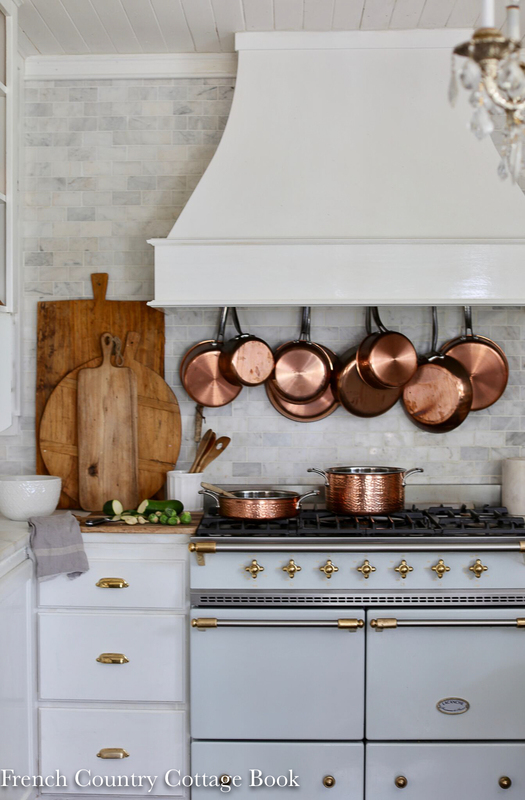 Those copper pots behind the range- simple, easy, accessible and pretty to look at. 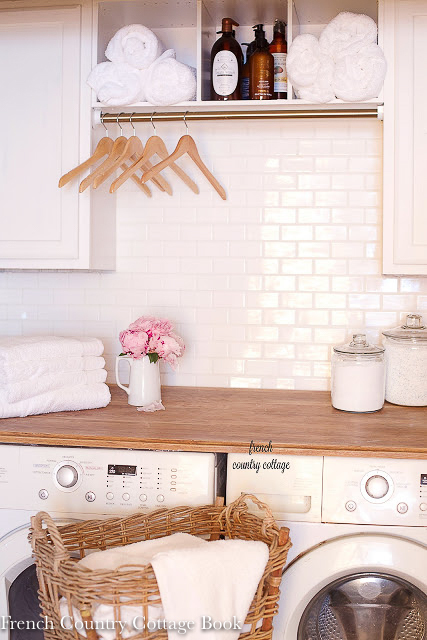 Simply use a bar and hooks to hang your copper pots behind your range and keep those pot cupboards more tidy. are perfect for pretty pieces that need a spot to go. 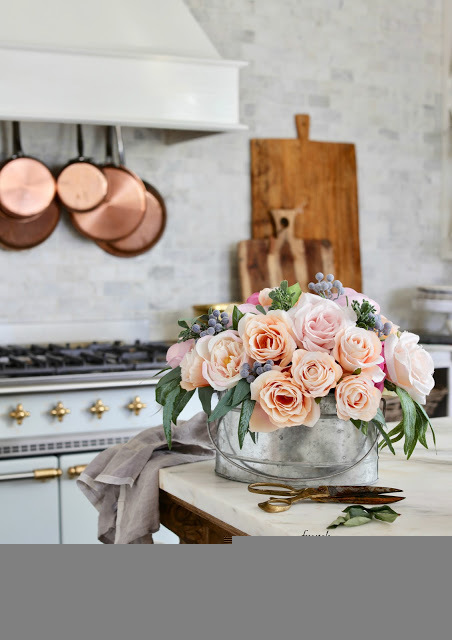 on the shelves along with fresh blooms for a pretty touch. Also out in the little cottage- a vintage once built in hutch provides a pretty storage option. 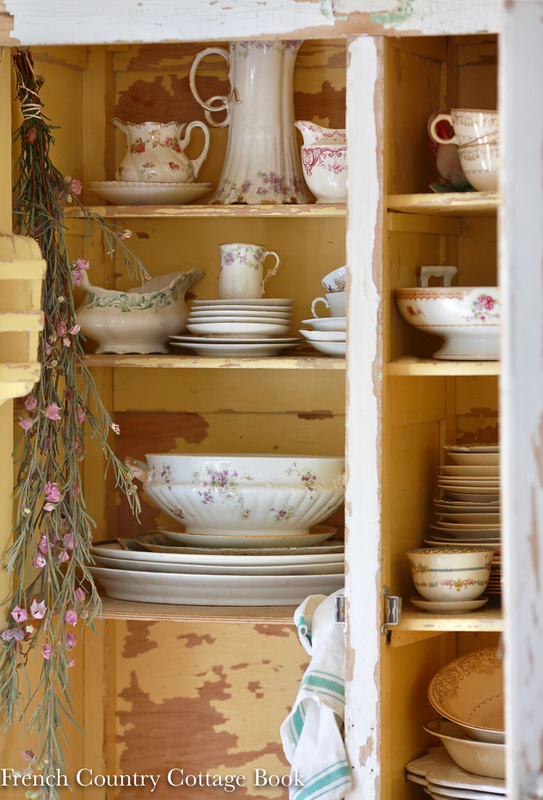 I gathered up those white dishes, plates, platters, bowls, pitchers and cake stands and stacked them on the shelves. By keeping the color scheme all one color, it creates a charming display while storing all of those pieces you use everyday and on occasion. Don't miss what my friends are sharing today as well! It's a great time to do it...when the weather is cold and wet and dreary. I love the way you group all of your pretty dishes together to create a display! Beautiful tips! Super tips! I have several like objects on display in our kitchen and family room because or kitchen (and our entire house) is smaller, and we lack storage. 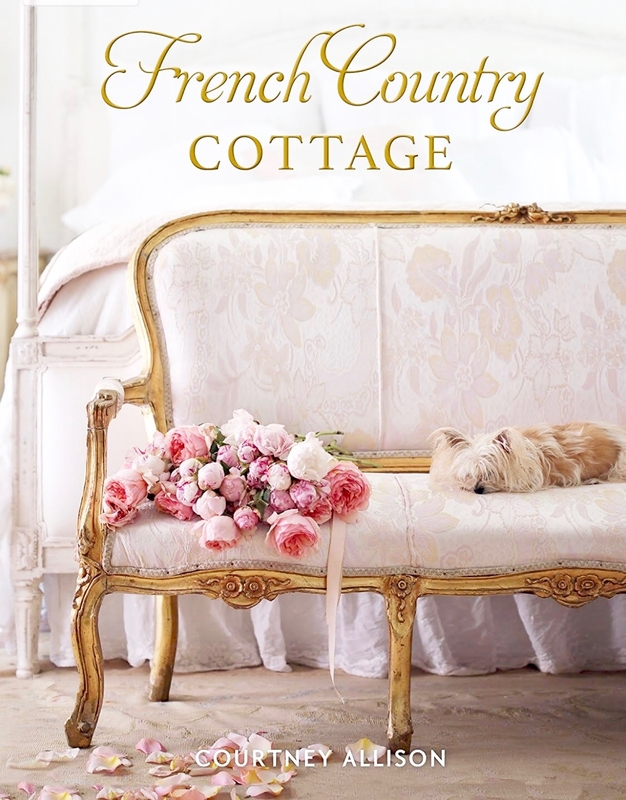 I keep everything neat, but another bloggers said she thought my "vignettes" look too much like a store. It hurt my feelings! What I have out and on display we use everyday, like a bottle dryer containing our mugs (we drink tea and/or coffee all day). This post makes me feel better because I think that your storage ideas are all very pretty! If I’ve learned anything from looking at all these blog posts, it’s that there is no wrong way or right way to display items in your own home. If it gives you pleasure to look at it, you should not care what someone else has to say. 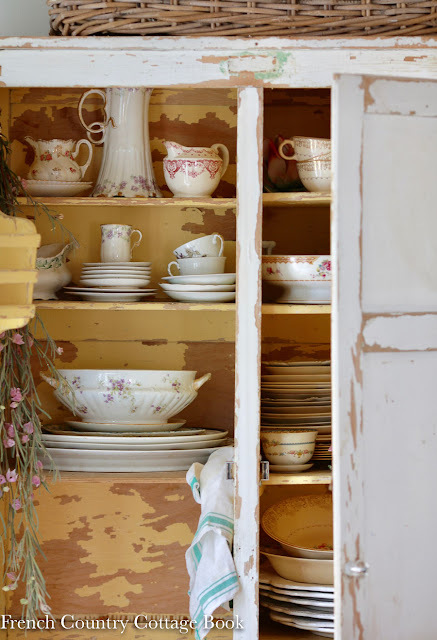 I love seeing all beautiful dishes on display and have an appreciation for the beautiful items of days gone by. 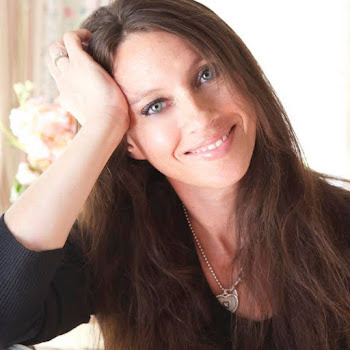 I bet your vignettes are beautiful. Gorgeous photos! Thanks for sharing- love all these storage suggestions! I find it so interesting how people organize items. You are definitely one who organizes by color! So pretty, as always. I tend to organize by item~~i.e. all pants together in the closet but I hang them from dark to light. Some people organize alphabetically or by project....it is just fun to think about! The key is that organization buys you freedom! So many great ideas!!! Every thing you do is gorgeous!! !